…why do I need the government’s permission to buy a gun? They already loaned me a free gun…spent over a million dollars to train me how to use it…sent me to a war zone for two years and threatened me with a court martial if I ever lost my gun. I started with research on the internet to find the best price for the best gun. I could not order it on any website since gun laws prohibit gun sales in MN except through a dealer. Fleet Farm is one of those dealers. However, I was told they could not carry more than a certain number of guns at the Lakeville location because a city ordinance limited how many they could have in stock…and the gun I wanted to check out was not one of the limited stock. I contacted several other dealers and found one that had the gun I wanted to buy. The dealer in Burnsville who had the gun in stock gave me the best price. But (you knew this was coming) I had to fill out a gun purchase permit with the Farmington police department (FPD)…wait 5-7 days while the FPD does a background check…and then FPD issues the permit before I can buy the gun in Burnsville. The FPD background check asked for the last five years of residency. I moved here from Arizona. In Arizona, you can buy a gun at Walmart, strap it on your hip in plain sight and walk around unchallenged. Perhaps officials in Arizona were confused when they received a permit to just buy a gun since Arizona has not replied after eleven days. FPD promised to check with Arizona and call me when the permit was approved. The lady at FPD was polite and helpful. She mentioned the large number of permits they are now processing. No doubt the politics in Minnesota…including a new attorney general…has had a huge effect. I’d like to ask whatever MN politician who came up with the permit to buy idea just how helpful is that to the FPD? Funny how a politician’s great idea is always mandatory…and somebody else is responsible for the paperwork. Gun control advocates will ask why I want to buy a gun. My answer: for the same reason women buy flesh colored, see through yoga pants. Using gun control logic for yoga pants, there should be a permit required showing actual enrollment in yoga classes. The yoga pants permit would be issued based on volume containment and an annual inspection involving a tax based on volume containment. That would eliminate many of the painful incidents involving yoga pants at Walmart that require eye bleach. 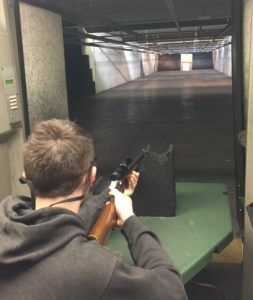 My first gun was a Winchester model 101 shotgun. It was purchased in Hong Kong (1965) during an R&R (rest and relaxation) period between combat operations. The actual R&R happened a couple of years later in the Minnesota woods; grouse hunting with our first Golden Retriever. Son #1 used my shotgun to bag his first pheasant (1982) on our farm. We also adopted several more Golden Retrievers. The second gun I purchased happened because I lost a bet with son #2 during a family reunion in Wisconsin. I wagered that I would buy that gun for him if he hit the double clay when competing against his uncles and cousins. Granted, you can’t eat clay pigeons but the grin on his face was worth the money. He still has the gun…and the grin whenever I mention it. My first shotgun cost $150.00 in Hong Kong…worth about $2,000.00 today. 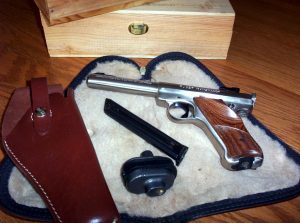 I bought my first handgun in the early 90’s for $179.00. Had it appraised last week by the dealer in Burnsville…$750.00. That’s a better return on the money than my IRA. Bet the IRS would like to know. Politicians have already confused the issue by using tax money to buy back guns. If they return $100.00 of my tax dollars to buy my gun, can I claim $650.00 depreciation? Daughter #3 (five foot nothing) outshot me on the range several years ago…with my gun! She has since gone into law enforcement and married a policeman. The new gun I am trying to buy may give me an advantage when I challenge them at the gun range. 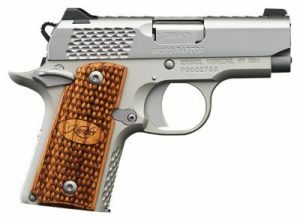 It’s a Kimber Micro Raptor .380ACP. Daughter #1 is also a good marksman but now lives in the Boston area where my grandson was born and raised. 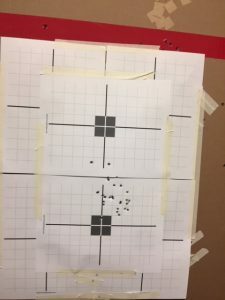 During a visit with me, I took him to a gun range to help zero in a new scope for one of my rifles. He had never handled nor fired a weapon before. Son #1 helped his nephew and the result was a fairly good grouping at 25 yards even though we never got the scope sighted perfectly. We’ll see how he does with a handgun during his next visit. You may have noticed I haven’t mentioned daughter #2…or as she claims…my favorite daughter. 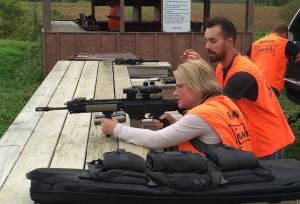 I have picture proof that she is more than familiar with guns. My website research included ammunition…all gluten free. I ordered 95gr .380 ACP ammunition over the internet and 250 rounds were delivered to my door in just three days without filling out a permit…duh? 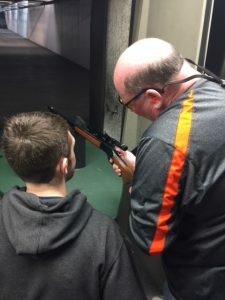 Once I buy the gun, there is a mandatory gun safety course ($89.90) in Burnsville for another permit from the Dakota County sheriff after another background check so I can carry the gun. There is no charge for the permit to purchase by the FPD. However, the sheriff’s permit to carry can cost up to $100.00 at the sheriff’s discretion. Sheriffs are elected. Maybe ask them for a yard sign along with the permit? State reciprocity laws for concealed carry permits are weird. My MN permit will be good in WI but a WI permit is not good in MN. There is a push for national reciprocity but has failed because a national permit is too far from common sense. Or, maybe a national law would eliminate some of the revenue at state level? 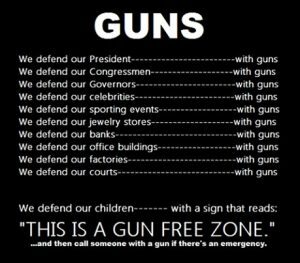 You may want to visit my article http://thefrankreport.net/why-politicians-love-gun-laws as the gun control argument continues to grow. That argument includes the term gun violence. As a responsible gun owner, I tested my guns by placing one on the deck and checked frequently. It had not moved…no dead bodies anywhere near. Admiral Yamamoto said Japan would never invade America because there is a gun behind every blade of grass. The debate on gun control has been going on for decades. Isn’t it about time the argument focused on people control as a solution? The lame stream media always provides an extensive, empathetic, weeks long report on the stupid people who kill innocent people in a gun free zone…but forget about the people with guns who stop them. There are literally over 20,000 gun control laws. Some of those laws make as much sense as my yoga pants law. I’m not advocating carry permits for everyone. I’d suggest that local law enforcement handle that as they are in the best position to keep stupid people from carrying guns in public. 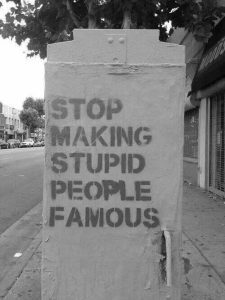 If not “stop and frisk” …maybe “pause and eyeball”? If some punk has a record of carrying a gun without a permit, wouldn’t it be prudent to stop and frisk to make sure they’re not doing it again? Every state has control over drivers they allow on the road. A visit to any DMV office will scare hell out of you. Stupid people will be able to buy guns just as they can buy a car. However, a license to drive…or carry…puts the burden on the stupid person to be really stupid and face jail time if they do so without a permit. When I finally get my new gun and the carry permit, the government will never know how many guns I already own…just that I am responsible and knowledgeable about gun safety when I carry one. I can live with that…literally. In the meantime, I promise to never buy and wear yoga pants.